Jailing Corrupt Politician, Officer Or Judge ! New Delhi (UNI) – With a 72-year-old fasting for five days, the government today announced a panel to draft within 83 days a Bill for Lok Pal– 45 years after it was conceived to regulate Indian governance. Anna Hazare broke his fast amid euphoria at authorities yielding on an issue government after government has dodged for decades without discarding the idea outright. The announcement listed ten members, five each representing the United Progressive Alliance government and the activists, with Finance Minister Pranab Mukherjee as chairman and former Law Minister Shanti Bhushan, as co-chairman. ”The Joint Drafting Committee shall complete its work latest by 30th June, 2011,” the announcement by the Law and Justice Ministry said. The members include Home Minister P Chidambaram, Law and Justice Minister M Veerappa Moily, Human Resource Development Minister Kapil Sibal and Water Resources and Minority Minister Salman Khursheed on one hand, and septuagenarian Hazare, Justice N Santosh Hedge, advocate Prashant Bhushan and activist Arvind Kejriwal on the other. Dr Moily has been named convenor. Experts hailed the development but were cautious about expectations. A document titled Salient Features of Jan Lok Pal Bill circulated by activists who pitched their camp at Jantar Mantar on Tuesday spelt out some of the ideas they brought to root out corrupt. — Requiring Lok Pal to provide protection to those victimized for raising their voice against corruption. Activists say citizens denied ration or voter cards or passports could turn to a Lok Pal as could those having difficulty lodging complaints with police, for instance. Although Lok Pal, as a political ombudsman was conceived 45 years ago, it is still nowhere around. 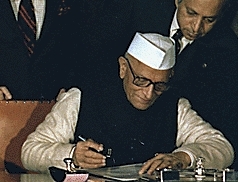 The concept of Lok Pal– inspired by Sweden’s ombudsman– grew out of an interim report on redressal of citizens’ grievances submitted in 1966 by the Administrative Reforms Commission headed by Morarji Desai. Two years later, the Lok Pal and the Lok Ayuktas Bill, 1968 was introduced in the 4th Lok Sabha, when late Mrs Indira Gandhi was Prime Minister. It was considered by a joint committee of the two Houses of Parliament and passed by the Lok Sabha in 1969. It was pending in the Rajya Sabha when the Lok Sabha was dissolved. The bill lapsed. Resistance to the bill appears manifest in the fact that even after being tabled seven more times– in 1971, 1977, 1985, 1989, 1996, 1998 and 2001– it has never again been put to vote. While authorities did not enact a Lok Pal they certainly did not reject it– possibly because doing so might have placed on them the onus to find a substitute. Indeed, in 2007, a second Administrative Reforms Commission recommended appointing a national ombudsman called Rashtriya Lok Ayukta instead of Lok Pal. Critics say corruption in public life has been sinking lower and lower, compounded by a virtually unaccountable governance. Agencies or institutions once created in public interest appear to have become part of the problem instead of being instrumental in finding solutions. The past year or so has seen unprecedented– in sheer size– allegations of financial irregularities levelled at the UPA government. Public mind has been disillusioned by one scam after another whether it is 2G– underselling mobile phone licences at public cost notionally estimated at Rs 1.75 lakh crores– or Rs 70,000 crore extravagance in organising Commonwealth games. For rule of law to find a sound footing in India, the nation must attend to a lot more legislative reform, experts acknowledge.